Walking down the street in the heart of New York City is an experience that can't be duplicated anywhere else in the country, perhaps even the world. One merges into the impromptu flow and is carried along by the ongoing current of migratory souls. Harvey Stein documents the iconic areas of Midtown and Downtown Manhattan in 172 beautiful black-and-white photographs taken over 41 years, from 1974 through 2014. The photographs are intimate and personal. They document the close encounter between the photographer and his subjects while showing the mutuality between people. The black-and-white images enhance the sense of the past. To heighten the feeling of movement, anxiety, and vigor, blur, grain, low-angle flash, skewed perspectives, tight cropping, and wide-angle views are employed. The images sweep the viewer into the experience and feel of walking the streets of New York City. 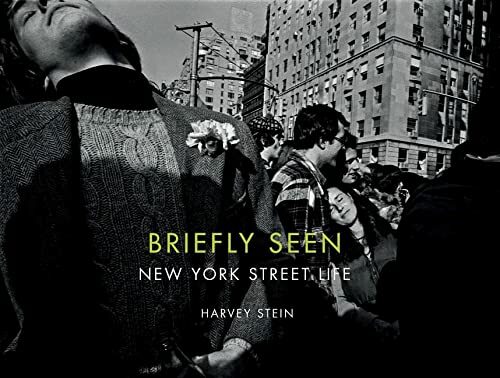 Harvey Stein is a professional photographer, teacher, lecturer, and author based in New York City. Currently he teaches at the International Center of Photography and has been a member of the faculty at the New School University, Drew University, Rochester Institute of Technology, School of Visual Arts, and the University of Bridgeport. Stein is a frequent lecturer on photography both in the United States and abroad. He is Director of Photography at Umbrella Arts Gallery in New York's East Village and has curated over three dozen exhibits since 2007. A recipient of a Creative Arts Public Service (CAPS) fellowship and numerous artist in residency grants, Stein's other photography books include Harlem Street Portraits (2013), Coney Island 40 Years (2011), Movimento: Glimpses of Italian Street Life (2006), Coney Island (1998), Artists Observed (1986), and Parallels: A Look at Twins (1978). Stein's photographs and portfolios have been published in such periodicals as The New Yorker, Time, Life, Esquire, American Heritage, Forbes, Smithsonian, and all the major photography magazines. Stein's photographs have been widely exhibited in the United States and Europe79 one-person and more than 160 group shows to date. His photographs are in more than 55 permanent collections.